Ordinarily the process of observation involves mainly the sense of sight that renders the physical features of the observed scene with all its hues and colours and the shades of meanings they generate. This is especially so for objects and phenomena observed at a distance. But there are occasions when other senses enter our field of attention and give additional dimensions to what we observe. Two senses that are known to play prominent roles in colouring our observations are those of smell and hearing. There is however another sense, less known perhaps, but nevertheless much felt, that enters into our perception. This is the sense of body experience, which until recently was only vaguely described by such imprecise expressions as gut feeling. In this paper the author describes how studies of the functioning of the brain explain how emotional experiences give rise to these feelings and affect our observations, giving rise to the notion of experiential observation. Recent research has shown that input from the senses enters the brain along two parallel paths, one going to the thinking rational brain and the other to what has been called the emotional brain. 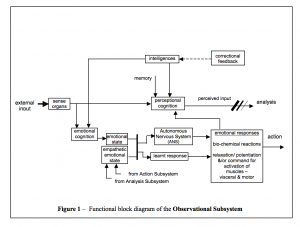 Viewing the brain as an information processing system, Figure 1 shows the flow of the information from the sense organs. The rational brain is represented here by the perceptional cognition block, which is its first function. In this block, various elements from the different sense organs are interpreted with the application of intelligence and with reference to previous interpretations stored in memory. The output of this block is the perceived input and this flows into the next functional block for further processing for analysis and evaluation and for subsequent action. The input from the sense organs also flows simultaneously into the emotional brain. The first function of the emotional brain is to interpret the input signals. This is done in the emotional cognition block. The function of this e-cognition block is to identify and interpret the signals that would lead to an emotional state, which in turn gives rise to an emotional response. This depends on the nature of the input, for example an evasive action could be triggered if the input represents danger, or, as in the case of fear or anxiety, the autonomous nervous system that controls the functioning of our various body organs could get activated. This goes on at the subconscious level without our being aware of it. It also leads to signals to the muscles for action, or at least to the possibility of action. This aroused state of being gives rise to a feeling in the body that feeds back into the cortex and becomes additional information for interpreting the observation. Thus every observation has associated with it an emotional response that is reflected in some kind of a somatic experience, which the body retains for future cognitive processing. The emotional response to a given set of inputs could range from the pleasant to the fearful. The understanding of such manifestation of emotions is very important in our management of human relations. They add to our capabilities of empathy and love, as also our understanding of approval/disapproval, perceived right and wrong etc. This paper will examine the more common emotions usually considered by Western researchers and also the more exhaustive list of emotions mentioned in the Eastern literature, notably the Natya Shastra of ancient India. Although the evolutionary process has equipped us with a variety of emotional responses, the actual experience of emotions in a child’s life is usually limited. Furthermore, somatic reactions often get muted because the predictability of some stimulations in the routine of our everyday life leads us into lowering our sensibilities. As a result one tends to adopt a blasé attitude to emotional situations and the observations do not get registered in their totality. Dancing, with its trained representation of a wide range of emotions could especially be an apt tool for the honing of emotional sensibility in children. This could train them in making every observation an experience rather than a mere image or a data set. With the development of a refined experiential observation capability, the child would acquire an additional dimension to cognition, which would in turn lead to a refinement of one’s aesthetic and creative urges and an improvement in interpersonal relationships. LeDoux, Joseph (1998), The Emotional Brain, Oreant Publishing, London. Levine, Mel (2004), “Celebrating Diverse Minds”, The Best of Educational Leadership, ASCD. Nakra, Harbans (2000),“The Place of Dance in Basic Education”, Proc. DaCi Conference 2000, Regina, Canada. Barr, Sherrie and Lewin, Philip (1994), “Learning Movement: Integrating Kinesthetic Sense with Cognitive Skills”, Journal of Aesthetic Education, Vol.28, No.1, Spring 1994. Ghosh, M.M. (rev. 3rd ed.1995), English Translation of the ancient Indian Sanskrit treatise on Dramaturgy, The Natyasastra, ascribed to Bharata Muni. Gardner, Howard (1993), Multiple Intelligences: The Theory in Practice, Basic Books, New York.